For audio engineer Eddie Gonzalez with Multi Image Group headquarted in Boca Raton, Florida, there are few venues that provide that kind of broadband for the multi-sensory events his company puts on for clients. In addition to more than 3,000 Sony LCD displays throughout, the stadium holds one of the world’s largest high-definition TVs, weighing in at 600 tons and hanging from 20-yard line to 20-yard line. But to tap into all that, Eddie had to overcome a problem. His main DiGiCo SD10 mixer has an Optocore 2G fiber interface on it, which provides multi-mode fiber connectivity. The stadium takes single-mode. He needed to convert one to the other. The solution turned out to be a small blue box made by FiberPlex called the TD-6010, which is a universal SFP frame that can take any variety of electrical or optical SFP, from MADI and ETH to single-mode and multi-mode fiber. The TD-6010 frame has two cages, an input cage and an output cage for SFP plug-in modules. SFPs from FiberPlex come in BNC, SD/HD-SDI, as well as full-duplex optical, BiDi, and HDMI-DVI and for multi-mode and single-mode optical. The TD-6010 supports up to 12.5 Gbps per SFP for high bandwidth applications. Now, whenever Eddie heads over to the AT&T Stadium to set up an event, he brings along the TD-6010 to run audio over fiber from the mixer to various stage racks throughout the stadium. Typically, audio jogs from the 50-yard line to the end zone inside of the stadium, and between two levels, from an upstairs broadcast booth and down again to FOH racks and then backstage. Being able to convert multi-mode fiber out of the DiGiCo mixer into single-mode fiber using the TD-6010, he is able to tap into yards and yards of existing optical cabling throughout the stadium’s infrastructure. Both the distance capability and the immunity to noise make fiber a good choice. “The distances are insurmountable for copper. 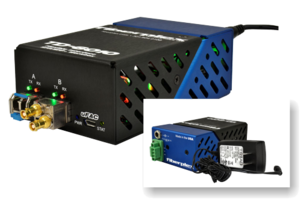 And, fiber doesn’t pick up noise, plus you don’t have to worry about where you pull power from, since it’s electrically isolated,” explains Eddie, who says he carries his TD-6010 and TIS-8632 in his audio toolbox at all times just in case he needs a quick interface to fiber…or other. "A couple of times, I’ve run into a MADI situation, and sure enough, I got an SFP for that, too,” he says. What's the Spectre Your VoIP will Meltdown? RF Transceiver supports China's unlicensed frequency bands. ULP Transceiver supports phase-difference technology.